Liam had a special project due tomorrow for school. I believe the guidelines were fairly simple: decorate a pet rock. But Liam's far from simple. He breathed his own life into the project and floored me with the results. Everyone else is planning on using Styrofoam. 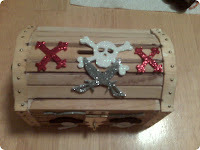 Liam bought a little pirate chest and tricked it out. Put some skulls and swords and crossbones on it. Blinged it up. There are all kinds of little features and the pictures I took didn't do it any justice. Liam even customized the inside! Then came the actual pet rock. My boyo went outside and dug until he found one he was happy with. A great big, smooth black hunk of rock, the size of my palm. And them the decorating began in earnest. 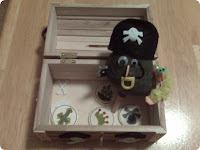 Not happy with just cutting out a little felt hat, Liam added a little skull & crossbones to the top. He put a miniature parrot on the left shoulder. A silver hook on the right hand. And a peg leg to bring it all together. One of the finest pet rocks I've ever beheld. 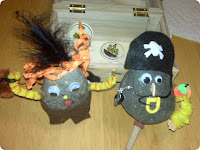 And easily the best pirate pet rock in the South. Not to outdone. 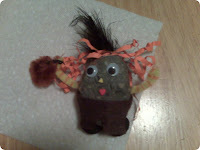 Meg took up the challenge and created a pet rock of her own. A princess rock, at that! I'm not as good with fashion and design as Meg, so some of the details escape me. I think she has a dress and shawl, and flowing red hair. And a pouting red mouth. Sadly, I've forgotten what she named her pet rock. I'm sure it was something like Elisabeth or Isabella or Claire. A very fun and exciting adventure for the kids. They did a great job and surprised me and Cindy with their creativity. We need to find similar activities for some weekend projects. Maybe next time I'll create an updated flashback of my own.